Megumi Mizumura ACR works as a paper conservator at the British Museum. In June this year, a Tru Vue grant sponsored her participation in the 20th Meeting of History and Archives at the National Archives of the Republic of Cuba. Here, she eloquently details every part of her experience. It was in middle of February 2018 when I first visited Cuba on holiday. While I was staying in Old Havana, I visited the National Museum of Fine Arts for Cuban Art, displaying the extensive collection of Cuban Art, from the Colonial period to the present. Among the paper based objects displayed, I saw a mounted print of Che Guevara in a frame, which shows the edges of the discoloured acidic window mount. That made me think about conservation in Cuba, especially the availability of materials used in conservation and preservation. Upon my return to London, a peer conservator, who had presented a talk at a conservation meeting in Cuba more than 15 years ago, forwarded the information on the 20th meeting of history and archives at the National Archives of the Republic of Cuba for historians, archivists, and conservators in June. After having given my talks on Japanese paper used in western conservation at the ICON Book and Paper Group’s London conference in 2015 and the ICOM-CC’s Copenhagen conference in 2017, I wanted to present a talk on this topic in the Spanish-speaking community. Since I’ve become more familiar with travel arrangements for Cuba (such as the visa procedure), this meeting was a natural choice. Fortunately, my talk proposal was accepted by the conference committee and I started communicating with Dr Sofia Borrego Alonso (Head of the Laboratory of Preventive Conservation, The National Archives, Cuba), a committee member, for my travel preparation. When I arrived at the José Martí International Airport in Havana, I felt immediately that it was hotter and more humid (average: 23-33°C and 81% humidity) than back in February (average: 17-27° and 65-77% humidity, cool at night). There were thunderstorms almost every night, which created more humid climate in the morning when the sun rose. In February I stayed at a ‘casa particular’ (Cuban bed and breakfast) in Old Havana, full of historical buildings, museums and many tourists. This time I chose to stay in Central Havana, which displays similar architectural styles to Old Havana, but with more local people and a feeling of local community. From the area I could easily walk to the National Archives in the southern Old Havana. The area has its particular charm and I enjoyed strolling the streets every day. The National Archives was founded in 1840 to conserve and preserve archival heritage, holding more than 27 km of historical, political and patrimonial documents. During the meeting (from 5th to 7th June), more than 70 specialists in archival heritage were gathered from various countries. The general director of the National Archive welcomed us and opened the meeting divided into three discussion tables: History, Archives and Conservation & Restoration, addressing a wide range of issues. Since there were no sessions for Conservation and Restoration on Day One, two fellow conservators from the National Archives of Australia, Cheryl Jackson (Assistant Director) and Prue Mckay (Senior Conservator), and I decided to explore Old Havana. When we got to the northern part of Old Havana, We visited the Paper/Photography Studio of the Conservation and Restoration Section at the Office of the City Historian. The office was created in 1938 to share knowledge in heritage restoration and preservation with institutes in other cities throughout the island. The studio is in the modern air conditioned building, located in the historical but popular tourist area. Cheryl and Prue were invited to work on the iron gall ink project there in 2016. They worked with Cuban conservators to treat historic iron gall ink documents, mostly historic plans, dating from the period 1550-1661, and passed their knowledge and experience to them. Most of the documents were written on Western handmade paper with an official stamp, probably made of pure cotton or linen. They had been previously stored in old buildings in tropical conditions with high humidity, and showed ink degradation, damage from handling, and so on. One of the Cuban conservators, Judith Machado Yanes, has been working on the project since 2016 and showed us the progress and the skilfully-treated documents, using Japanese tissue and methylcellulose. The sessions for Conservation and Restoration at the meeting started on Day Two. Cuba has a year-round tropical climate with two seasons; the dry season (Nov-Apr) and the wet season (May-Oct). Since objects are constantly exposed to the hot and humid environment, the stability of climatic parameters is one of main concerns for conservators in Cuba. They work together with biological and chemical specialists to deal with environmental issues, pest control and mould problems. One of the other topics discussed at the meeting was digitisation, used to preserve the contents and originals, and to facilitate users’ access. Also the problem of storing huge digitalised information was discussed. Three presentations including mine, given in English with Spanish texts, and the following Q&A sessions were translated into Spanish. Prue’s presentation was about the National Archives Preservation Facility (NAPF) in Canberra, which was opened in June 2017. Their new building is environmentally sustainable (minimising energy use, greenhouse gas emissions and its environmental footprint). 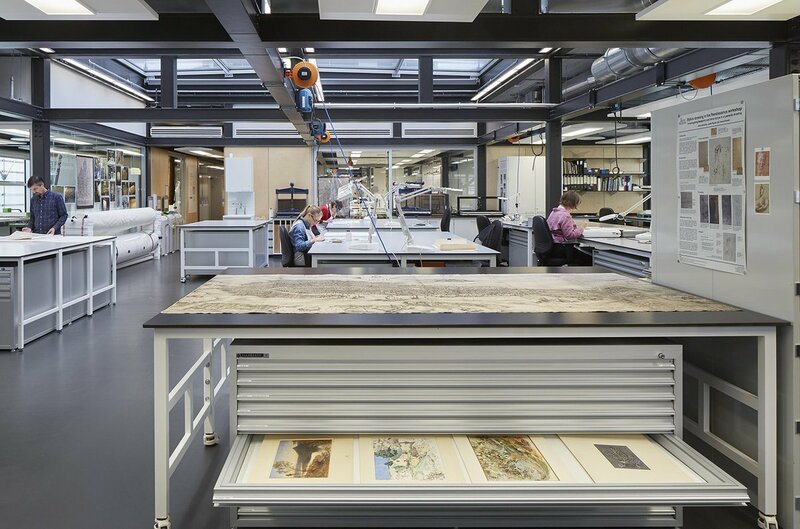 There are controlled storage spaces and specialised preservation facilities for approximately 25% of the extensive collection, consisting of paper records, audio-visual records and digital archives. The information on sustainability would be useful and adoptable for institutes in Cuba. Chery presented the information on photographic conservation, including storage, digitisation, and climate issues. My talk, presented on Day Three, consisted of the information from my previous talks on the use of Japanese paper in Western conservation at conferences in 2015 and 2017. I talked about the modern Japanese papermaking and introduced an idea of the classification system of Japanese paper used in Western conservation for conservators to refer to. Since the supply of conservation materials, including Japanese paper, in Cuba is rather limited, I adjusted the contents to suit their situation and presented some examples of use of various Japanese papers for conservation treatments. Unfortunately the power went down unexpectedly in the middle of the talk! It seemed the whole neighbouring area was affected, thus I kept my presentation without the PPT images. Despite the misfortunate, my presentation received great interest from Cuban conservators. They were able to share a copy of my PPT file after the meeting to understand the contents better. During the discussion session, I learned that they had tried to make their own paper using locally grown paper mulberry and are trying to pursue it further, so it would be interesting to keep exchanging information in the future. As one of my on-going research topics is wheat starch paste and its use in Western conservation, I found the presentation on rice starch by Janet Diaz (The National Archives, Cuba) very interesting. She looked into adaptability and convenience of the starch paste made from the Cuban rice varieties and evaluated their flexibility, reversibility and stability over time to treat paper documents. Her study would seek further the possibility of replacing the expensive imported adhesives and could be extended for use in institutions throughout the country. She mentioned she used the article on tapioca (cassava) and wheat starches in paper conservation by Amelia Rampton (private paper conservator) as a reference, so I introduced them when I came back to London. Hope it may also develop into future exchanges of ideas. Aside from the meeting, I used my spare time to walk around the historical areas and visited the Feria de Publicaciones y Curiosidades (a daily flea market, formely called as Plaza de Armas Second-hand Book Market, now set in the corner of Calle Baratillo and Calle Justiz) and local second-hand bookstores. The market is full of antique coins, vinyl records, revolutionary propaganda books and posters, military pins, Russian memorabilia, etc. So many temptations and one could easily come back with a suitcase full of curiosities. When the meeting finished, there was a chance to go to the seaside, Santa María de Mar (30 mins on bus from Havana), to feel the ocean breeze, escaping the unbearable heat in Havana and cooling down. The meeting itself and networking with conservators there were not just beneficial for my professional development, but also the experience will help when conveying the information on Japanese paper in western conservation and will expand the idea of a classification system for the paper for the future. The receipt of an Icon Tru Vue CPD grant, together with the support from the British Museum, made my attendance at the Meeting of History and Archives possible.